Shake with ice and strain into a Highball glass filled with ice. Top with 2 oz Barritts Ginger Beer, garnish with a lemon twist, and add a straw. Two Mondays ago, I wandered over to Eastern Standard to grab lunch. I did not realize it before I got there, but it turned out to be bartender Kit Paschal's last day at Eastern Standard before he heads north to Portland, Maine. While bartender Seth Freidus made my drinks that day, both of them were Kit Paschal originals. 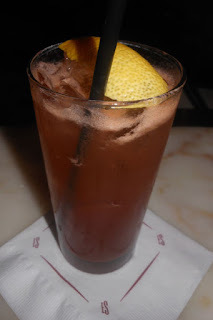 The first was the Patriot Sling which was Eastern Standard's DrinkOne menu item -- a charity drink to support the victims of the Boston Marathon bombing. Kit explained to me that he named it after the attack falling on Patriot's Day, a Massachusett's holiday that coincides with the Boston Marathon, and that he opted to use Plantation 5 Year Barbados from the list of possible liquor sponsors for the charity. A lemon oil and ginger nose led into a sip that was carbonated, lemon, and initially caramel. Over time, the caramel in the sip gave way to honey flavors. Finally, the swallow began with rum and ginger notes and ended with a honey finish.